Peterson, Jean and Janice Milton. 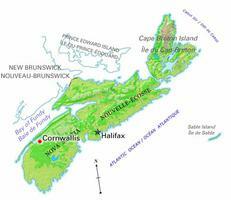 "Canadian Forces Base Cornwallis". The Canadian Encyclopedia, 03 July 2015, Historica Canada. https://www.thecanadianencyclopedia.ca/en/article/canadian-forces-base-cornwallis. Accessed 20 April 2019. At war's end, Cornwallis became a Discharge Transit Centre for navy personnel transitioning to civilian life. In 1946 it was decommissioned, but post-war political uncertainty caused it to be recommissioned in 1949. Canadian Forces Base Cornwallis (1942-1994), CFB Cornwallis was located at Deep Brook, NS, on the Fundy Shore, 17 km east of DIGBY. The early years of the Second World War necessitated a naval training base large enough to accommodate Canada's expanding naval requirements. The Department of National Defence, in 1942, recommended a training centre be established at SHELBURNE, the most suitable location from a naval viewpoint. But for reasons of expediency it was commissioned at Deep Brook on 1 May 1942 as HMCS Cornwallis, with training beginning early in 1943. During the war it was the largest naval training base in the British Commonwealth. At war's end, Cornwallis became a Discharge Transit Centre for navy personnel transitioning to civilian life. In 1946 it was decommissioned, but post-war political uncertainty caused it to be recommissioned in 1949. HMCS Cornwallis's primary role was as a training facility for new entry seamen, but new training roles were added such as the Leadership Division for naval officers and summer training for naval cadets from the University Naval Training Divisions. In 1951 regular-naval training for female personnel began when 25 women arrived on 2 October to become the first full-time wrens to serve in the post-war navy. With the unification of Canada's armed forces in 1968, HMCS Cornwallis was designated as a CANADIAN FORCES BASE. It was no longer a purely naval training centre but was the home of the Canadian Forces Recruit School (CFRS), the training centre for English-speaking recruits of all 3 elements of the Canadian Forces. Political cutbacks forced the closure of the base, which was directed in 1994. Now called Cornwallis Park, it is a residential community and an industrial park.